Online consultation: on the future of the libraries – City of York Council website. Libraries really shouldn’t be struggling to justify their existence to get the necessary funding. If they didn’t already exist we’d invent them. It seems to make perfect sense for a community to have a central repository where resources we don’t actually need to have our own copies of can be held for us to borrow and return. Not only in times of austerity, but any time. I love the library for its thoughtful safeguarding of books I might want to read sometime if I haven’t already. And particularly for keeping really obscure books of purely local interest. Or books bought and kept because of a local connection most of us may not be aware of, but when we are aware of it, we might be glad we can just pop into York Explore and ask a librarian if they have a copy of The Wisdom of John Woolman. And they do. In the reserves, in the basement. We don’t all use the libraries, but I get the impression we all value them, think they’re something a society should have, for the benefit of all. Obviously, if there was a clear choice between ‘provide care for vulnerable people’ and ‘be able to borrow a book’ then people are more important. But it isn’t a clear choice, is it. Money saved on libraries would probably be wasted on consultants’ fees, for some vision or other. Of course, the modern library is about far more than just books. They offer so much now, and in doing so, cost more. And as we know, cutbacks are inevitable. The idea of taking them out of local authority control, to be run by a charitable organisation, has been mentioned. Seems odd to even consider messing things up, creating upheaval, when it seems to be working so well now. But then what do I know. I don’t work there. Maybe the staff would prefer to be out of local authority control. The library consultation seems to be, in large part, a way of attracting volunteers. I hope we’re not going to lose the qualified library staff. I just keep thinking about those poor old obscure but wonderful books in the basement. I want people looking after them who know their stuff. The library I use isn’t just valuable because of the books, but because of the people who know the books. 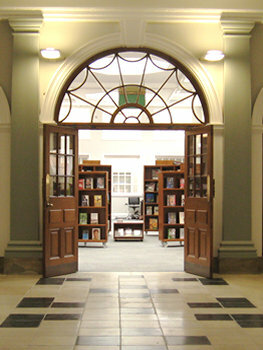 Libraries consultation: more details on the City of York Council website. On this site: Remembering libraries, posted a few days ago – looking for memories of/thoughts on our local libraries, particularly the smaller branch libraries. Without the Central Library, I would not have discovered Drakes History of the City of York; Heinrich Schleiman (Troy), the Bard’s complete works and so much more. Why I didn’t fail my O levels is beyond me as I read many texts except those proscribed. I used to attempt to read FAZ in German in the reading room to appear intellectual! I can smell the Reference Room from here and still hear the Peacocks calling at exam time each summer. The staff were wonderful and so tolerant of the Nunthorpe and Archie’s 5th & 6th forms each summer. No, it should stay in local authority control.